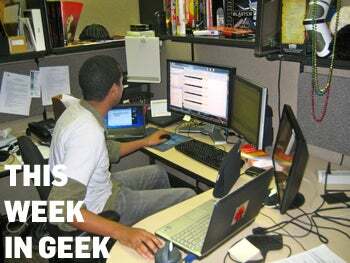 This Week in Geek: Welcome to the A/V Club! What's hot this week? How do iPad music apps, a new Flip minicam, a novel way of filming a TV series, and a hybrid amplifier PC sound? Intrigued? Read on. Resident music nerd David Saetang doesn't yet own an iPad, but he did some research into the state of iPad music production apps. What cool stuff did he dig up? Has he changed his tune on the iPad? See his story to find out. One music gear company had a novel idea: Take an ordinary PC, integrate an 8-inch speaker, a 1/4-inch audio jack, and load it up with software. What do you get? It may be the ultimate system for geeks who want to rock out. Rock on and read on!